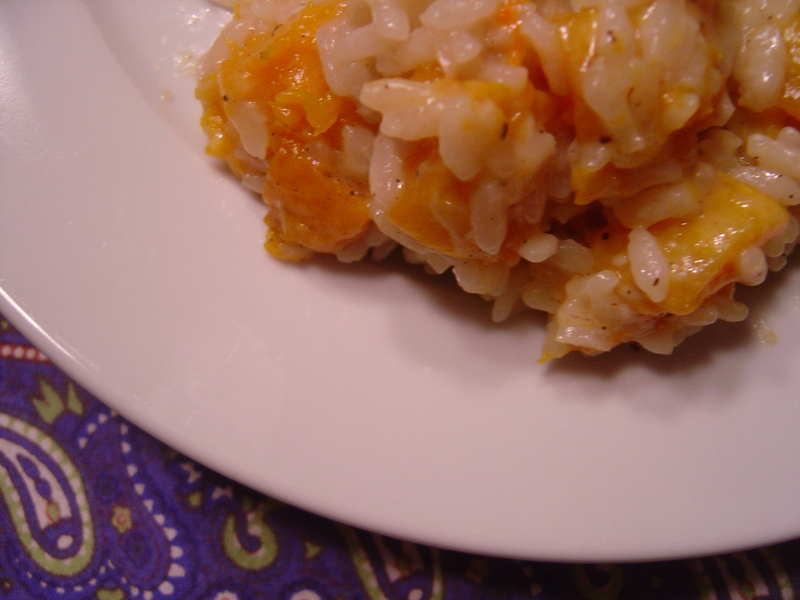 Anyway…this butternut squash risotto comes to us as October’s first Barefoot Bloggers recipe. This delectable risotto was chosen by Rachel of Rachel Likes to Cook in an effort to continue with the recent “harvesty” BB recipes. Rachel was spot on with this recipe. I actually ended up making it very shortly after the night it was posted in the BB blog as one of this month’s recipes. I just couldn’t let this recipe wait a single day before making it. Aside from butternut squash being one of the favorite fall foods, I have come to adore risotto in the past year. I’ve made it a couple different ways at home but since it does tend to be a time-consuming dish, I’m ALWAYS up for trying in restaurants…most being recently at The Sagamore hotel in the Lake George area of upstate NY where we celebrated our 2nd wedding anniversary. The hotel’s restaurant, Trillium, offered a Risotto of Braised Veal Cheeks and Marscapone Cheese…which happened to have a beef demi-glace drizzled on the plate around the risotto..Oh.My.God. was this incredible!! Like mouthwatering, finger-licking-, where-can-I-find-this-in-Connecticut good. OK…so I’ve gotten off course here, distracted by the braised veal risotto…what can I say? Great food distracts me! Ina butternut squash risotto is right up there with some of the best I’ve had…and all the better that I can make it at home whenever I please. I halved the recipe as I know that Kyle hasn’t been incredibly keen on risotto in the past. I roasted the squash the night before I made it to cut down on the night-of prep work and then heated it in the microwave before mixing it into the risotto. I skipped the saffron – too expensive. I halved the Parmesan cheese – it would have been too salty. The end result left me wishing I had made the full recipe. It was perfectly creamy. It was full of flavor. It was autumn food at its best. It was awesome. So awesome in fact, that Kyle sneaked the leftovers into his lunch “trough” (read: lunch cooler) the next day without my seeing…that should say enough about the recipe without my having to rave about it. So if you’re looking for an incredible risotto recipe, have a few extra minutes on your hands (or 50 – not the 30-40 Ina said it would take to make), and have a good deal of patience to not rush the cooking process, you must try this recipe. You will not be let down. 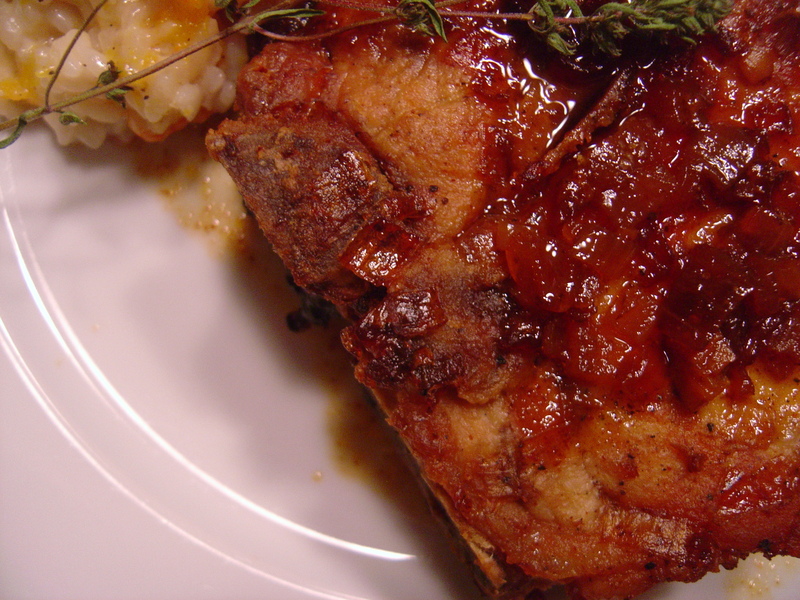 Better yet, pair this risotto with some maple braised pork chops from the crockpot and see where your taste buds take you. Thanks again to Rachel for choosing such a wonderful recipe that I know most of the group loved! Great job!! Be sure to check out the BB blog (Whose Turn Is It? tab) to see how much the group this recipe and for next month’s recipes (which will be posted tomorrow). 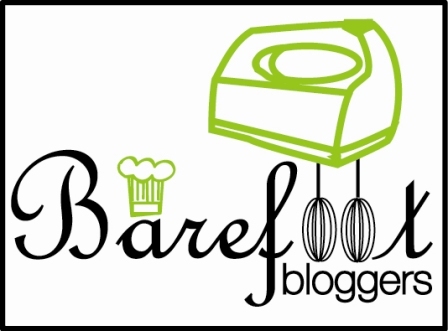 Oh…and by the way…check out the Barefoot Bloggers new avatar – pretty snazzy eh?? I love your disclaimers, recipes always take longer than they say they’re going to.